Men Outfits with Braces– Braces have always been a great addition to men’s attire and it is not as rare to see as you may think.Lets check how to wear suspender . The set of men’s braces originally performed the role of what the belt does nowadays and at that time the belt was more of a fashion accessory rather than offering a practical use. 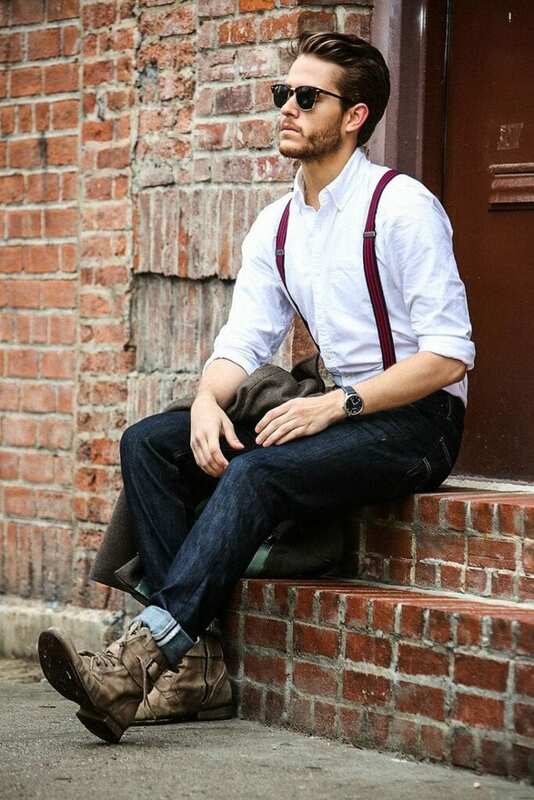 But how do you wear braces?latest men style with suspenders?what outfits to wear with suspenders and for what occasion? what shirts color can be worn with it ?We have brought these 20 ideas to answers these queries . Some may think that braces are just plain black and the only choices they have are the thickness of strap. However this is definately not the case. Braces, now making their mark in the fashion world, are found in different colours and patterns so discovering a set to go with your chosen outfit is even easier than ever. No need to stick to original black although black does give off the vibe of sophistication. Ideal Shirt to Wear With – Well most commonly white shirts are perfect choice for braces.But over the last few years new trends have come up.Fashion bloggers have given it a new style.Now you can wear with casual clothes too of any shirt type. Even though colours of braces are wide in choice, it should be remembered to choose a style and colour that compliments your outfit. In other words, don’t run the risk of looking like you belong in the big ring with huge shoes and a red nose just because you have picked red and yellow multicoloured braces with your white shirt. You want to be taken seriously as well as pull the braces look off. So keep your look simple and the brash colours and patterns for the fancy dress parties. To keep your look casual why not leave top buttons undone and wear Timberland boots or other styles of ankle boots. Not only is this an easy touch which will not break your bank balance but will also denote masculinity and a hint of attitude. This post contains 20 great ways in which guys can use braces to their full potential. Why not have a go at creating your own style using this great accessory? #20- Casual Wear. Use thin braces with a pale blue shirt, dark jeans and brogues to break up colour. Hats with a matching thickness of ribbon will compliment braces beautifully. #19- Braces with White shirts and dark blue jeans is always a winning style. Complete this with burgandy stripe braces and ankle boots. The stripe pattern on these braces are acceptable as the blue matches the jeans. Finish this look with shades. #18-With Check Shirt. A casual look with braces to match the colours in the shirt. Skinny jeans are of a contrasting colour and hair is combed nicely to one side. #17- Smart casual. Simple long sleeve white top with blue jeans and brown brogues. Dark braces to complete this style and a nice rugged hair do. #16- Street Style Look. White shirt, unbuttoned with black suit trousers and matched with brown thin braces, brown trainers and flat cap. These items make for a more laid back and casual outfit. #15- Fashion Blogger Style-Great look with rolled up trousers over timberland boots. Blue shirt over a plain white t-shirt and matched with dark blue braces. Simple but effective style and a great look for students. #14- Yes you can Wear on Beach. I’m sure most women would like this way of wearing braces. So simple but yet oh so appealing. White vest and black trousers with black slit braces. Couldn’t be easier! #13- The braces and bow tie are the key features to this trousers and shirt combination. The tartan bow tie and the plaited braces with buckles look absolutely stunning in this outfit. #12- White half buttoned shirt with black rolled up jeans. Match this combination with pale grey braces for a subtle colour contrast. Use brown leather and suede brogues and matching driving gloves for a quirky look. #11- Barbershop style. Gorgeous look incorporating checkered shirt and jeans with black waistcoat. Touches of red in the hat, bow tie and patterned braces make this outfit stand out. 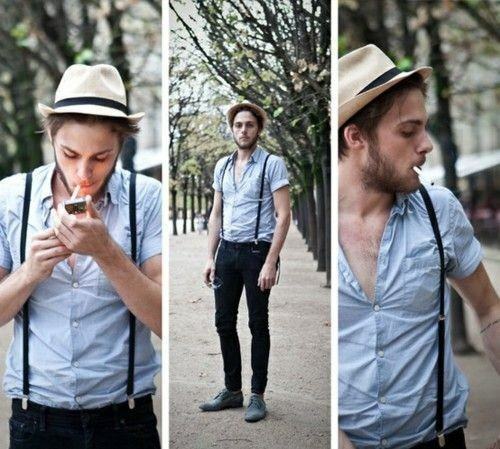 #10- MDV Italian Men Style-Braces can sometimes be worn with a jumper if done so correctly. Casual wearing of braces here will break up the jumper colour and brighten up the overall look. Finish with ankle boots for a touch of attitude. #9- Formal Style. Perfect for weddings or any other formal engagement without need for a tie. Pinstripe suit with white shirt look amazing and the braces create a feature so there is no need for a tie unless you plan on wearing the jacket the whole time. #8- Plaited Braces and Bow Tie in Full. The flat cap, bow tie, braces and oxford shoes match in colour palette and are broken up by the blue jeans. Perfect city look. #7- Black Man Wear. Pale blue shirt contrasted with dark gunmetal grey trousers and matching square end tie. Pale striped braces are perfect for this look as they do not overwhelm the colours. Finish this look with a trilby or fedora style hat and brown polished buckled shoes. #6- Classy Style. Black patterned shirt with blue jeans and stunning brown ankle boot brogues. The white stripe braces compliment this look by matching the white top under the shirt and breaking up colour. #5- Stunning Summer Style. The red braces for this outfit stand out and compliment the colour palette, however, personally I would not have them as thick. A thinner red brace would give that perfect amount of colour for this lovely summer look. The classic shoes finish this look beautifully. #4- Button Features. Lovely blue shirt with dark blue bow tie and matching pinstripe trousers. The brown braces match the shirt buttons perfectly and also have gorgeous button hole features which make this outfit stand out. #3- Simple Casual Look. Long sleeve top with blue straight fit jeans. Complete this look with brown ankle boots and tan coloured braces. #2- Unique Way! Why not wear your braces down? There is no need to keep them on your shoulders so use them as a great accessory which will enhance your style and look amazing. #1- Stripes. How to do it without looking like a clown. The red and blue stripes not only match the paisley tie but also go hand in hand with the blue suit. Broken up by the white shirt and accessorised with black shades and nice watch, this is a great way to wear those stripey braces. Where can I find the shirt with brown buttons? Nice update on fashion trends as usual. I usually can’t find good suspenders information anywhere. I just love the comfort of braces, they keep my pants up so well. But, I always thought that they should be kept covered. Now my gf has pointed out this great site, I can wear them out loud and proud.